The 2012 Paris Motor Show officially kicks off later this week! This year all of the major automakers will be pulling out all the stops to wow the crowd, and we've rounded-up the eight green cars debuting at the show that we're most excited to see. This year Lexus will use the show to preview its new hybrid powertrain, Honda is updating its sporty CR-Z hybrid and Peugeot proves that supercars can be green with the Onyx Concept. The Lexus LF-CC concept previews the next-generation Lexus IS and a new hybrid powertrain that will eventually be offered in the Lexus lineup. 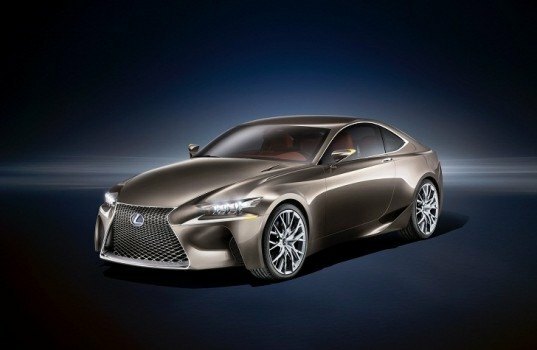 The LF-CC concept takes the design of the LF-LC concept that was unveiled earlier this year and applies it to a smaller rear-wheel-drive coupe. Under the hood the LF-CC concept gets a new 2.5L hybrid powertrain that combines a 2.5L four-cylinder engine to an electric motor. We can expect to see this new hybrid powertrain in the next-generation 2014 IS. 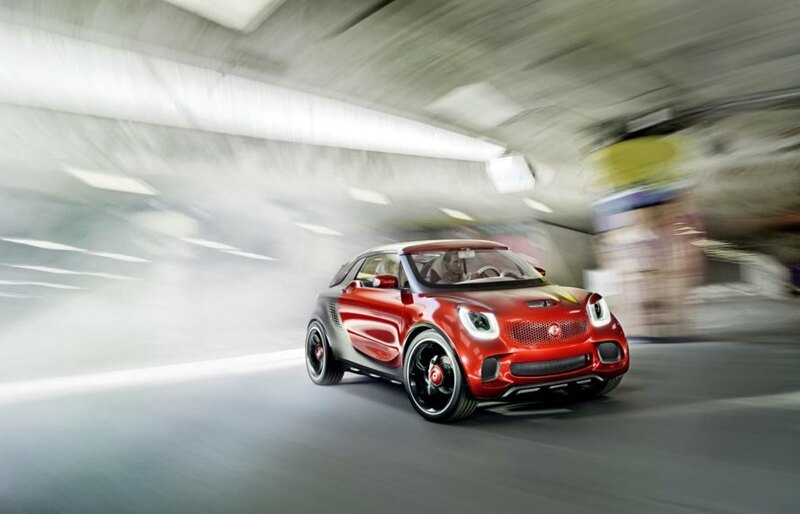 Smart’s current lineup only consists of the Smart fortwo, but the new smart forstars concept is proof that Smart is looking to expand its lineup. 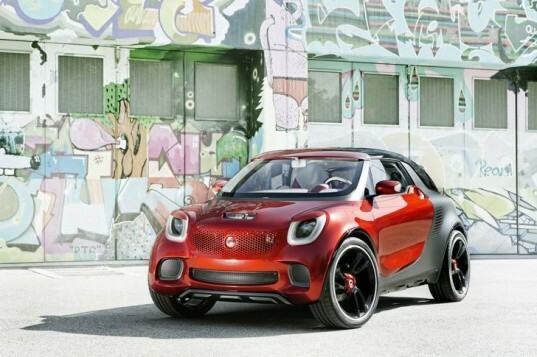 The Smart forstars concept is a two-seater just like the for two, but Smart describes it as a Sports Utility Coupe. The forstars concept is longer and taller than the fortwo, which means that there is more room in back for all your gear. Rather than power the concept with a standard gasoline engine, the forstars concept is powered by a 60 kW electric motor. One other cool feature is the integrated movie projector on the hood that will transform any area into an animated open-air cinema. BMW is bringing the Concept Active Tourer Plug-in Hybrid to Paris to show off the automaker’s new eDrive hybrid system and its new compact MPV. The Concept Active Tourer previews a new MPV that is aimed at buyers that want a car with a small footprint, but with a raised seating position. The BMW Concept Active Tourer is powered by a turbocharged 1.5L three-cylinder engine that sends its power to the front wheels and an electric motor powers the rear wheels. The plug-in hybrid system has a total of 190 horsepower and the electric motor and lithium-ion battery can power the concept up to 18 miles in full electric mode. Nissan currently does not offer an SUV in its lineup that is powered by an electric motor or hybrid system, but Nissan is using the new Terra SUV concept as proof that it is ready to make a “green” SUV. 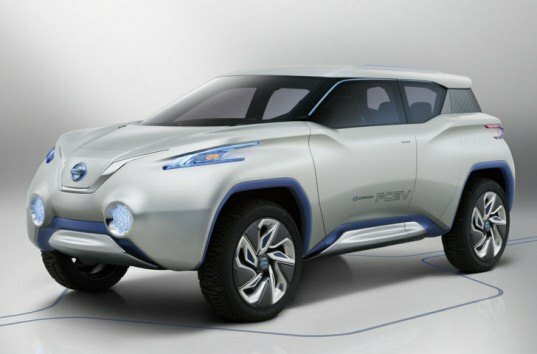 The Nissan Terra concept is powered by a hydrogen fuel cell stack and the same electric motor as the Nissan LEAF. Nissan states that the Terra Concept was designed for today’s buyers that want an eco-friendly vehicle, but that is at home both in an urban setting and in the wild. Mercedes-Benz is going to unveil an electric version of the small B-Class MPV, the Concept B-Class Electric Drive. The Concept B-Class Electric Drive looks almost identical to the standard B-Class models, with the exception of the “Electric Drive” logos. It is powered by a 100 kW electric motor and a lithium-ion battery. The Concept B-Class Electric Drive has an estimated driving range of 124 miles. Mercedes-Benz will release the B-Class Electric Drive in 2014. Honda’s small two-seater hybrid, the CR-Z is getting a refresh for the 2013 model year. 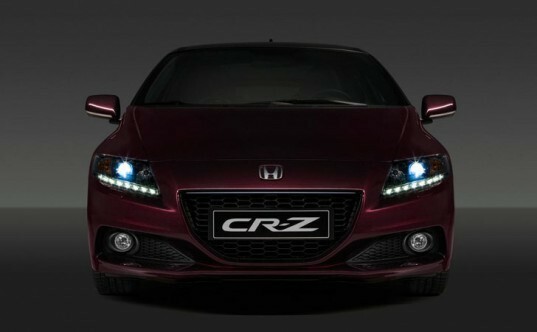 Honda has released this teaser photo of the new 2013 CR-Z, which gets some cosmetic updates like LED headlights and new alloy wheels. Honda has also confirmed that the 2013 CR-Z’s hybrid powertrain will generate more power, but without compromising its fuel efficiency. 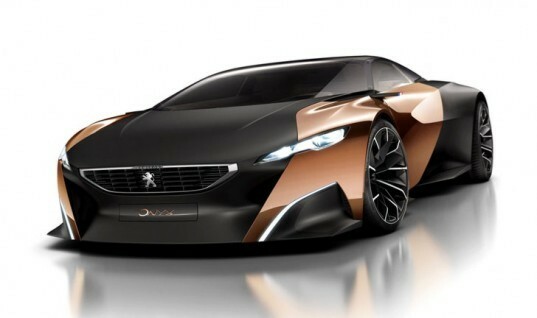 The Peugeot Onyx hybrid sports car concept is a new green supercar, that combines the aggressive exterior you expect from a supercar but with a green powertrain. The Onyx is powered by a 3.7L V8 diesel engine and an electric motor that combined gives the concept over 600 horsepower. Other unique features are the concept’s two-tone matte black and bronze exterior and its minimalist futuristic interior that looks like it’s straight out of a sci-fi movie. Mitsubishi is using its stage at the Paris Motor Show to debut the all-new Outlander Plug-In Hybrid. When the Outlander PHEV is released early next year it will be the world’s first plug-in hybrid SUV. The Outlander PHEV looks almost identical to the gas powered Outlander, but is powered by a four-cylinder engine and two electric motors. The Outlander PHEV features three different driving modes and can travel up to 34 miles in full electric mode. Smart's current lineup only consists of the Smart fortwo, but the new smart forstars concept is proof that Smart is looking to expand its lineup. The Smart forstars concept is a two-seater just like the for two, but Smart describes it as a Sports Utility Coupe. The forstars concept is longer and taller than the fortwo, which means that there is more room in back for all your gear. Rather than power the concept with a standard gasoline engine, the forstars concept is powered by a 60 kW electric motor. One other cool feature is the integrated movie projector on the hood that will transform any area into an animated open-air cinema. BMW is bringing the Concept Active Tourer Plug-in Hybrid to Paris to show off the automaker's new eDrive hybrid system and its new compact MPV. The Concept Active Tourer previews a new MPV that is aimed at buyers that want a car with a small footprint, but with a raised seating position. 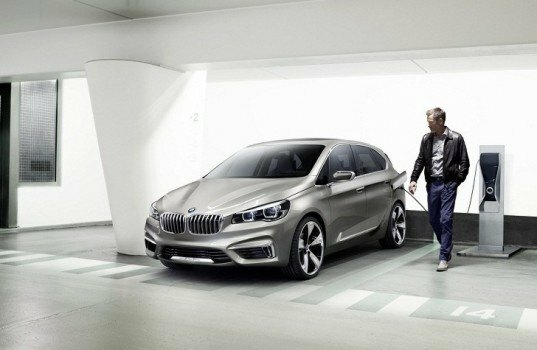 The BMW Concept Active Tourer is powered by a turbocharged 1.5L three-cylinder engine that sends its power to the front wheels and an electric motor powers the rear wheels. The plug-in hybrid system has a total of 190 horsepower and the electric motor and lithium-ion battery can power the concept up to 18 miles in full electric mode. Nissan currently does not offer an SUV in its lineup that is powered by an electric motor or hybrid system, but Nissan is using the new Terra SUV concept as proof that it is ready to make a "green" SUV. The Nissan Terra concept is powered by a hydrogen fuel cell stack and the same electric motor as the Nissan LEAF. Nissan states that the Terra Concept was designed for today's buyers that want an eco-friendly vehicle, but that is at home both in an urban setting and in the wild. Mercedes-Benz is going to unveil an electric version of the small B-Class MPV, the Concept B-Class Electric Drive. The Concept B-Class Electric Drive looks almost identical to the standard B-Class models, with the exception of the "Electric Drive" logos. It is powered by a 100 kW electric motor and a lithium-ion battery. The Concept B-Class Electric Drive has an estimated driving range of 124 miles. 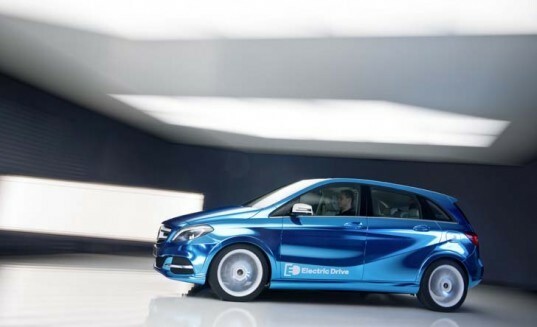 Mercedes-Benz will release the B-Class Electric Drive in 2014. Honda's small two-seater hybrid, the CR-Z is getting a refresh for the 2013 model year. Honda has released this teaser photo of the new 2013 CR-Z, which gets some cosmetic updates like LED headlights and new alloy wheels. Honda has also confirmed that the 2013 CR-Z's hybrid powertrain will generate more power, but without compromising its fuel efficiency. The Peugeot Onyx hybrid sports car concept is a new green supercar, that combines the aggressive exterior you expect from a supercar but with a green powertrain. The Onyx is powered by a 3.7L V8 diesel engine and an electric motor that combined gives the concept over 600 horsepower. Other unique features are the concept's two-tone matte black and bronze exterior and its minimalist futuristic interior that looks like it's straight out of a sci-fi movie. Mitsubishi is using its stage at the Paris Motor Show to debut the all-new Outlander Plug-In Hybrid. When the Outlander PHEV is released early next year it will be the world's first plug-in hybrid SUV. The Outlander PHEV looks almost identical to the gas powered Outlander, but is powered by a four-cylinder engine and two electric motors. 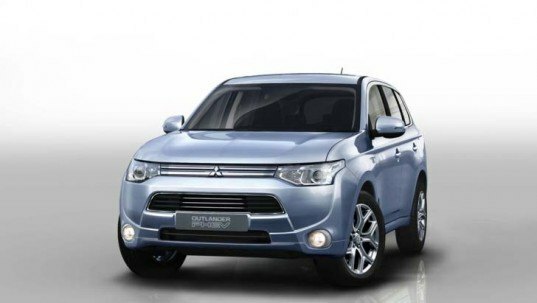 The Outlander PHEV features three different driving modes and can travel up to 34 miles in full electric mode.